video clips from “Settle Down” shoot! No Doubt tweeted an image of the Settle Down single cover today! Awesome!! Tom tweeted that the Settle Down music video will premiere on July 16th (the day after my birthday-yay!). Which is also the same day that the single becomes available, and when it hits the radio! I can’t wait to buy a BRAND NEW No Doubt CD! Also, Tom called into the Bloomberg radio talk show “Taking Stock” on the 26th, and gave a great interview! It’s really a must listen. I’ve uploaded an .mp3 here. I’ve also added the June 29, 2004 LA show to the videos section. It’s a really good recording. Hello! Webisode 2 is now online! Tom shared on twitter that the songs ”Looking Hot” and ”Sparkle” can be heard within. I am absolutely loving the sound snippets the band has shared with us so far from the new album! It’s going to be so awesome! The shooting began in the early afternoon on Tuesday, June 12 and consisted primarily of single shots of Tony, Adrian, Tom, and Gwen inside a gigantic sound stage. Around 1:00 AM the production moved outside to get individual performance footage of the band members. After Tom finished all of his performance shots, production wrapped for the day around 4:30 AM. Less than ten hours later everyone was back at Downey Studios ready for another full day of filming. Gwen finished all of her individual shots around 8:00 PM and production wrapped inside the sound stage immediately afterward. The crew packed everything up and headed outside to the back lot where No Doubt took the stage together for the first time over the two-day period to perform “Settle Down” live in front of the cameras. Expect the “Settle Down” video to hit your screens next month preceded by brand new webisodes and a ton of behind the scenes content from the video shoot. Also, EW magazine has mentioned the upcoming Good Morning America performance again in the June 29 issue! It’s #1 on their top 10 must list (along with a few other bands’ upcoming performances)! Hello! I just re-uploaded the Sunrise, FL 2002 show in mpg2 format here. enter to win tickets to the Teen Choice Awards! Teen.com is having a contest to win tickets to the Teen Choice Awards, where No Doubt is scheduled to perform “Settle Down” for the first time! “Every year the Teen Choice Awards bring together all of our favorite celebs for an amazing night full of awards and performances. Will Justin Bieber and Selena Gomez take home the surfboard for Choice Male/Female Hotties again this year? One grand-prize winner will get to experience all the action live in L.A.! Enter for the chance to win a two-night stay and two tickets to TEEN CHOICE™ 2012. It gets even better though because not only is airfare covered, but you will also get $250 to spend on the trip and an autographed Teen Choice surfboard! Album title, and first single announcement!!! Hope you are sitting down because we’ve got some really big news to share with you! While adding the finishing touches to our new album we realized it was time to name it…so we did, and the name is…(drum roll please)…Push and Shove !!! We also want to let you know that the first single from Push and Shove will be “Settle Down” and we’ll be filming the video for it this week with our longtime friend and collaborator Sophie Muller. Very exciting! We can’t wait to share it all with you. See you out there soon. Oh and P.S…Webisode #2 is on it’s way. Stay tuned! 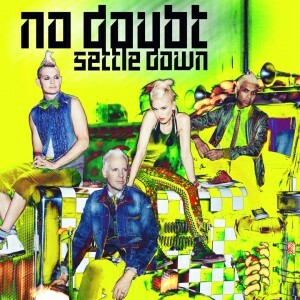 No Doubt’s new album Push and Shove will be released on September 25, 2012. The first single “Settle Down” will debut on July 16, 2012. The music video for “Settle Down” will premiere in early July. The video will be directed by Sophie Muller who has helmed many of No Doubt’s music videos including “Don’t Speak,” “Underneath It All,” “Sunday Morning” and “Simple Kind of Life”. I also added Bathwater live on Farmclub, Leno, and MadTV, as well as Ex-Girlfriend on Hermano Sic to this folder. Finally, I added the Sol Musica special that aired in Portugal, parts one and two. New post on the official! As No Doubt puts the final touches on their new album, the band is excited to announce their first series of live performances starting in July. The first performance will take place at this year’s Teen Choice Awards 2012. Fans can purchase tickets to attend the show on ticketmaster.com. 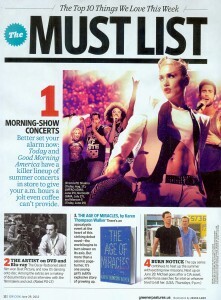 Tune into Fox on Sunday, July 22 to see No Doubt’s performance and check out Teen Choice 2012’s website for more info. Following Teen Choice 2012, No Doubt will perform on Late Night with Jimmy Fallon on Thursday July 26th at 12:35am/11:35pm on NBC. Fans can win tickets to access exclusive seats close to the band and an opportunity to surround the stage during No Doubt’s performance. For a chance to win these tickets, go to www.fallonbandbench.com and be sure to use the code “NOD” on the entry form. On July 27th, No Doubt will perform as part of Good Morning America’s Summer Concert Series at Rumsey Playfield in Central Park, NY. The performance will take place during Good Morning America (7:00-9:00am ET) and will be free and open to the public. Fans will need to arrive at Rumsey Playfield at 6 AM the morning of the show, no tickets needed. Check out Good Morning America’s website for more information. We are so close!!!!!!!! I can’t wait!! You are currently browsing the Greener Pastures – a No Doubt fan site archives for June, 2012.